Piezotome provides healing benefits when tooth extractions are made easy by the use of ultrasonic technology. The Piezotome is an exciting modality that enables us to extract teeth without disturbing adjacent teeth, bone, and soft tissue. This allows less postoperative discomfort after your extractions. 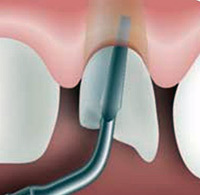 It is also the ideal way to extract teeth when an implant is going to be placed. The device generates ultrasonic vibrations which release tooth fibers that hold the tooth into its socket. This pioneering device is powerful, precise and silent. One of the advantages of the Piezotome is that it aids in making extractions faster and less traumatic to surrounding tissues. Our teeth are held into the sockets by periodontal ligaments. By using the Piezotome’s ultrasonic technology, we are able slide between the bone and tooth to release the tooth from the periodontal ligaments. Piezotome uses ultrasound waves in place of a conventional drill, and provides atraumatic surgical procedures and precision that is unmatched. This leading-edge, minimally invasive approach is another part of our dedication to providing our patients with the least post-operative trauma and improved quality of healing, for the most comfortable dental experience possible.